Lyon Village Parking Restrictions In the Works? What started as a fight over planned parking restrictions on one Lyon Park street seems to be spreading. Last week, residents of N. Danville Street and several other Lyon Village streets noticed county staff measuring street widths. Staff were reportedly checking to see if the streets were too narrow for trash trucks and fire trucks, as was the case with N. Edgewood Street in Lyon Park. According to Lyon Village Citizens Association President H.K. 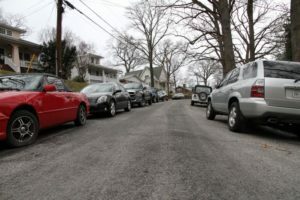 Park, the county is considering restricting parking to one side of Danville and other neighborhood streets that county staffers have deemed too narrow. On Monday, the LVCA will meet to discuss the possible parking changes with county staff. Representatives from several other civic associations have said they plan to attend the meeting “because they believe their neighborhoods are next,” according to Park. Among those who will be in attendance is Natalie Roy, president of the Lyon Park Citizens Association. Roy said that while the neighborhood recognizes the importance of emergency vehicle access, they’re still awaiting for an explanation of why the county is only starting to enforce width guidelines now, half a century after many of the roads in question were first built.